I just finished watching 'Beyond the Wall', the Episode #6 of Game of Thrones, Season 7 and before I share my views I must flash the mandatory SPOILER ALERT! The first thing that I would like to say about Episode 6 'Beyond the Wall' is that it even tops Episode 4 'The Spoils of War' and by some margin. I don't think that anyone who watches it would dare doubt that. As far as I am concerned it reminded me of the great Chinese/Tiawanese martial arts serials I grew up watching. I guess G.R.R Martin has some serious writing to do if he is ever going to top the spectacle that's the HBO series. There is no doubt whatsoever in my mind that 'Beyond the Wall' will go down in the history of television as one of the greatest ever. I must confess that my hands are shaking as I write this... and I don't think that they will stop shaking anytime soon having seen what I saw in the season's marathon episode # 6 (it’s duration is well over one hour). 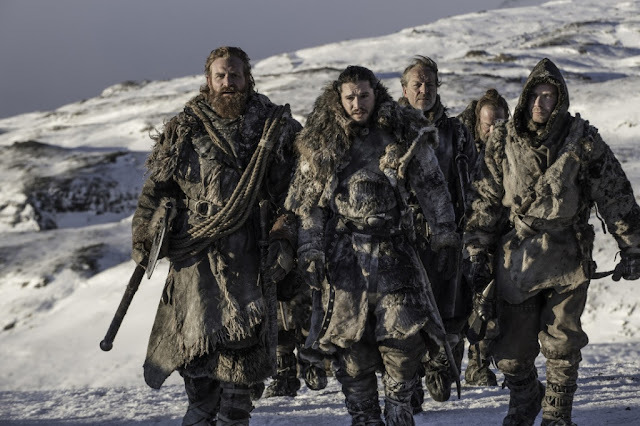 'Beyond the Wall' is a dream of an episode that will surely bring your darkest nightmares alive. I had talked about in my Ep. 5 review that it’s not going to be a cakewalk for Jon and men to capture a Wight but even I didn’t know that things would turn out to be so ugly for the Fellowship. Winter is certainly here and the North of Wall looks like Frozen Tundra. But it’s not the cold that’s the biggest worry for these brave men (after all, they are all properly dressed like Eskimos!). It’s what lurks behind the blinding fog and the icy winds that poses the real threat. First they encounter an unexpected member of the Night King's Army of the Dead: a humongous Wight Bear with the characteristic icy blue Walker eyes. It’s a grisly affair that leaves Thoros fatally wounded at the hands of the dead grizzly. The culprit is the Hound who yet again fails to overcome his fear of fire at a crucial juncture. It appears that the Lord of Light hasn’t truly blessed him yet. At one point the dead beast appears to be unstoppable. Even fire fails to slow it down. But just when it seems that it would kill them all dragonglass comes to the rescue, thanks to Ser Jorah’s presence of mind. Although losing Thoros is a big loss for the Fellowship it is Beric who suffers the most, for he has lost his guardian angel. With Thoros gone he now has no one to back him to life as and when he dies again. Next Jon and men encounter a small bunch of Wights marshaled by a solitary White Walker. When Jon kills Walker (taking his lifetime tally to two) using the Longclaw all the Wights too are automatically stopped save one which the men take as a captive to be presented in front of Cersei. Alas, its screams summon an army of Wights marshaled by the Night King himself! Slowly but steadily they get surrounded by more and more Wights as Jon orders Gendry to leave for Eastwatch and seek Dragon Queen’s help. Back in Winterfell we see Arya playing some nasty games with poor Sansa. It appears that Littlefinger’s clever little schemes have finally started paying some dividend. Arya has got hold of the letter that Sansa had once sent Robb begging him to come to King’s Landing and swear fealty to King Joffrey. Sansa finds herself cornered even more when Arya threatens to use the letter against her. A visibly scared Sansa summons Littlefinger and asks him how the hack Arya got hold of the letter. “She seems very resourceful,” replies Petyr Baelish. It’s just the kind of opportunity that Littelfinger has been waiting for all along. After all, it’s been his master plan to win over Sansa’s trust and marry her. It’s his only bet if he is to ever sit on the Iron Throne. One will have to wait for the season finale to find out how things shape up for Lord Baelish. According to some GoT fans things are going to turn really ugly for him come Ep. 7. 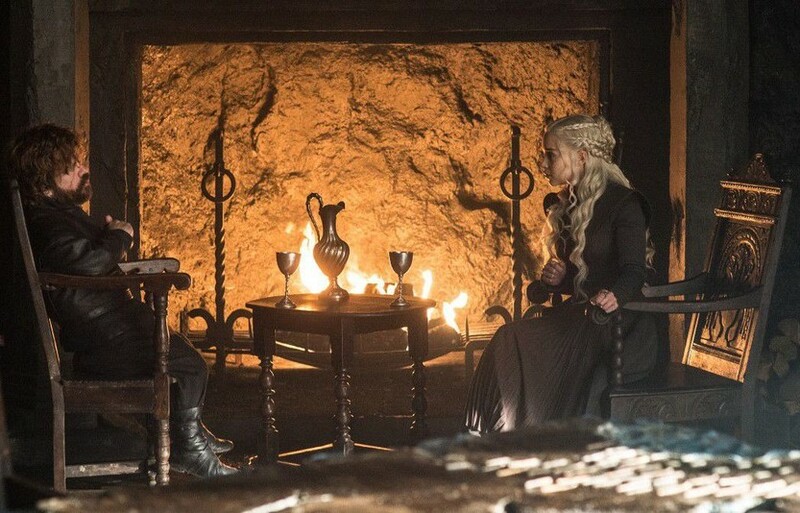 In Dragonstone, Tryion and Dany are busy discussing some very serious things. Tyrion seems rather worried about the succession after Dany hangs her boots. For, she cannot bear children owing the mishap she suffered in Season #1. Tyrion’s doubts leave Dany both perplexed and annoyed making her question his loyalty. “We will discuss the succession after I wear the crown,” declares Danny before walking away in high dudgeon, as we once again see a worried look on Tyrion's face. Beyond the wall the Wights continue to close in on Jon and men. It now looks like a matter of time before it’s all over. The action keeps cutting back to Gendry who can be seen sprinting towards Eastwatch. He falls but not before reaching the castle’s gate ensuring that the raven is sent, alarming the Mother of Dragons. As Jon and men await their fate we see Dany in a beautiful winter attire, looking all set to launch another air raid. Tyrion tries his best to stop her but yet again fails to change her mind. Jon and men prepare for one last hurrah as the encircling army of Wights continues to approach them. In Winterfell, Sansa receives an invitation to come to King’s Landing. Sansa is in no mood to make another epic blunder and so she asks Brienne to go on her behalf. Brienne, however, doesn’t want to leave her alone, especially with Littlefinger around. But Sansa doesn’t see it that way. Brienne then offers to leave Podrick behind but Sansa is unmoved. “I do not need to be watched over or minded or cared for. I am not a child, I am the Lady of Winterfell and I am home. This is the safest place for me,” she tells Brienne in an authoritative voice, leaving with her no option but to comply. Just when it seems that Jon and men are about to meet their maker, three fire breathing dragons come to their rescue with the Khaleesi ridding on the back of the biggest of them. It’s a sight to behold! Danny dressed in white, looking like some angel, and her three dragons unleashing their fury on the army of the dead. But just when it seems that the Wights would be obliterated the Night King does the unimaginable. He slays Viserion with his deadly ice weapon. All we hear are dragon screams as everyone else looks on helplessly. The poor beast falls to the ground, bleeding profusely, leaving Dany devastated. The time is opportune for one more epic stare between Jon and the Night King which bring back memories of Hardhome. “Go… Go… Leave,” shouts Jon on realizing that the Night King next intends to slay the mighty Drogon. 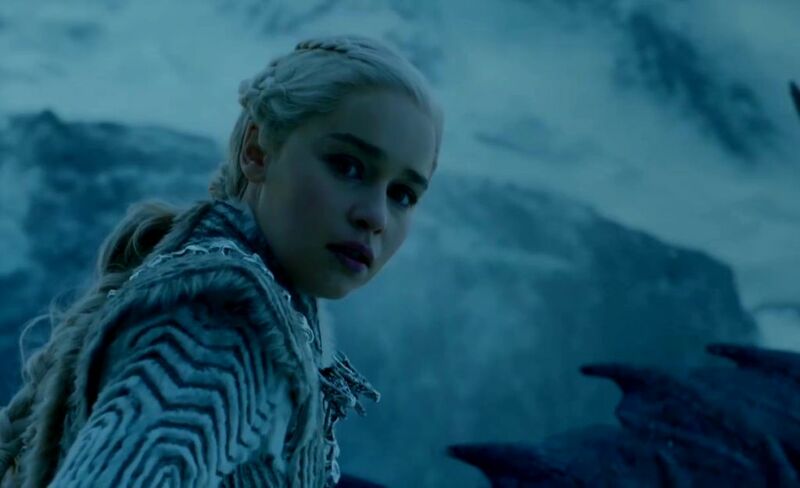 The Lord of the Rings enthusiasts would be reminded of Gandalf's famous line, “Fly, you fools!” The Night King aims for Drogon but he misses as Dany is forced to flee from the scene, taking the Fellowship’s remaining members with her except Jon who is left behind. Fortunately for Jon, Uncle Benjen comes to his rescue, sending him out of harm’s way. But will he make it to the Eastwatch alive? At Eastwatch, we then see Dany waiting in anticipation at the top of the tower. Losing both Viserion and Jon in such a quick succession has left her completely devastated. “It’s time to go, Your Grace,” pleads Jorah. “I will wait longer,” announces Dany. So she waits and waits and waits. Voila! A wounded man arrives at the castle gates on the back of his horse. The man is none other than Jon Snow. It’s nothing short a miracle. The King in the North lives to fight another day! Jon opens his eyes and sees Daenerys. “We are going to destroy the Night King and his army and we will do it together,” she tells an apologetic Jon. The two share a few tender moments as Jon calls her ‘Dany’ before referring to her as ‘My Queen’. She holds Jon’s hand as their eyes meet. Words sometimes are so futile, especially when the images are so powerful. Speaking of images, it’s the final few ones that are most chilling. 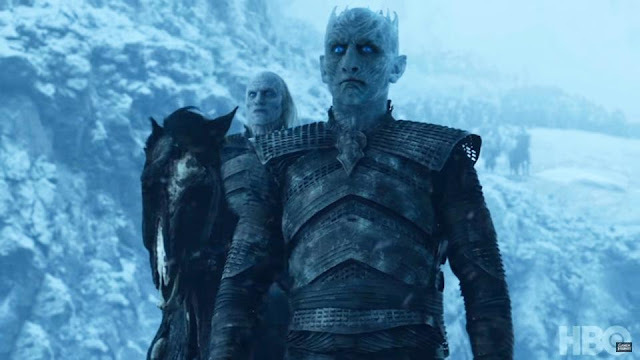 Now I know it’s difficult to imagine anything more chilling than the Night King slaying a dragon but just consider hundreds of Wights working in tandem to pull something out of the depths. 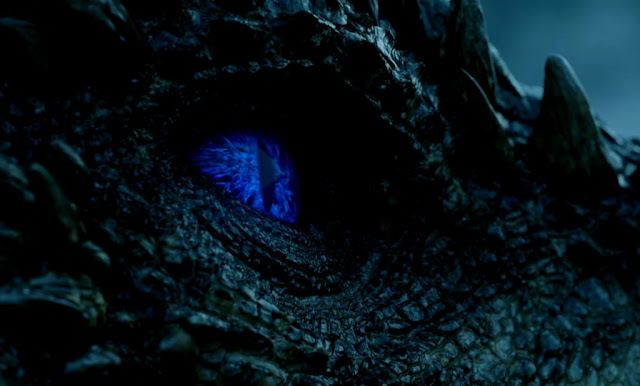 What they are trying to pull out is nothing but Viserion’s corpse. Next we see the Night King approach it. He puts his dreaded hand on the dead dragon’s head. And suddenly its right eye opens, glittering like a blue ruby. Holy s**t!!! The season finale is going to be a cracker of an episode (it is also going to be the longest of the season, even long than 'Beyond the Wall'. While it may not be as devastating as ‘Beyond the Wall’ I am expecting it to be a rollercoaster of an affair. So you better brace yourselves for a few cliffhangers! Sorry. This was one of the worst episodes of the season. Spoils of war was the best.